VATICAN CITY (CNS) — U.S. Cardinal Edwin F. O’Brien, grand master of the Equestrian Order of the Holy Sepulchre of Jerusalem, celebrated his 80th birthday April 8, meaning he is no longer eligible to enter a conclave to elect a new pope. His ineligibility leaves the College of Cardinals with 121 members who are under 80 and could enter a conclave. Eighteen of the voters were made cardinals by St. John Paul II; 46 by Pope Benedict XVI; and 57 by Pope Francis. The college has a total of 222 members; according to the Vatican, the oldest is Colombian Cardinal Jose Pimiento Rodriguez, the former archbishop of Manizales, who turned 100 in February. But March 18, 2018, the government of Mozambique celebrated the 100th birthday of Cardinal Alexandre do Santos, retired archbishop of Maputo; however, according to the Vatican, he was born in 1924, not 1918. The United States has 15 cardinals, nine of whom are under the age of 80. Only Italy — with 44 cardinals, 22 of whom are under 80 — has both more cardinals and more cardinal electors. When Pope Francis created 14 cardinals in June, he set aside Pope Paul VI’s limit on 120 cardinal electors. The college should return to the limit April 27 when Polish Cardinal Stanislaw Dziwisz, retired archbishop of Krakow and former personal secretary to St. John Paul II, turns 80. 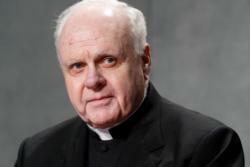 Cardinal O’Brien’s birthday also marked the end of his membership on the Vatican congregations for Eastern Churches, Saints’ Causes and Catholic Education. The cardinal was born in the Bronx in 1939 and was ordained to the priesthood in 1965. His first assignment was as civilian chaplain at the U.S. Military Academy at West Point, where he served until 1970. Becoming an army chaplain, he ministered at Fort Bragg, North Carolina, and in Vietnam. From 1990 to 1994, he was rector of the Pontifical North American College in Rome and was named an auxiliary bishop of New York in 1996. The next year he became head of the U.S. Archdiocese for the Military Services and, in 2007, archbishop of Baltimore. Pope Benedict named him grand master of the Knights of the Holy Sepulchre in 2011 and made him a cardinal in 2012. He participated in the March 2013 conclave that elected Pope Francis.